When we moved to the Mediterranean island of Malta last autumn, we imagined that our leisure time would be devoted to exploring the country’s heritage sites, soaking up the sunshine, and strolling by the inviting blue water that encircles the tiny nation. Back then, we couldn’t imagine all the red tape that we’d have to ‘cut through’ in order to settle into another new country. At times, we were feeling a bit overwhelmed by it all. Once we overcome bureaucratic tasks like securing a visa and finding an apartment, it was time to get acquainted with our new home, which boasts 7,000 years of history and a fervor for festivals. Not long after we arrived, Malta ‘rolled out the red carpet’ for world leaders who attended a high-profile summit and a meeting of Commonwealth nations. And shortly thereafter, Malta’s communities began ‘painting their towns red’ with traditional saint’s day festivals (festas), and lively celebrations of the Carnival, Christmas, and New Year’s sort. When we finally had time to appreciate these details, we went from feeling daunted to being delighted by our new surroundings. As I reminisced upon the past six months on this colorful island, I noticed that red hues are especially plentiful. From the country’s flag, to its crimson-colored phone booths and enclosed balconies, Malta abounds in red. The Mediterranean island nation of Malta may be diminutive, but its limestone buildings’ distinctive door knockers and knobs make a big impression. Known as il-habbata in Maltese, the knockers largely feature maritime motifs such as dolphins, sea horses, and fish, but I have also spotted a plethora of Maltese crosses, even delicate brass hands, which reminded me of those I saw during past travels to Morocco and Tunisia. 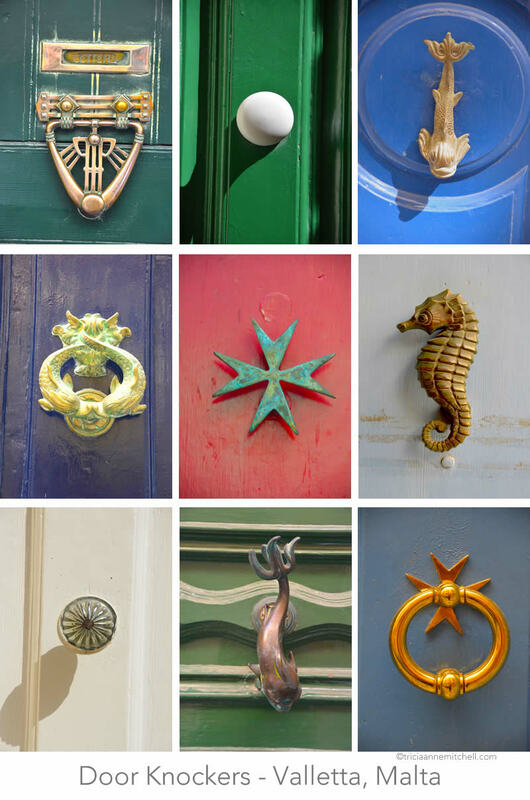 I collected this bunch of door adornments in Malta’s capital city of Valletta.